For Valentine’s Day, Ben bought me a Bamboo tablet. I’ve been having such fun with it. I went ahead and cartooned Ben using Adobe Illustrator and my new tablet. This isn’t a DS106 assignment, but it totally should be. Cartoon You! 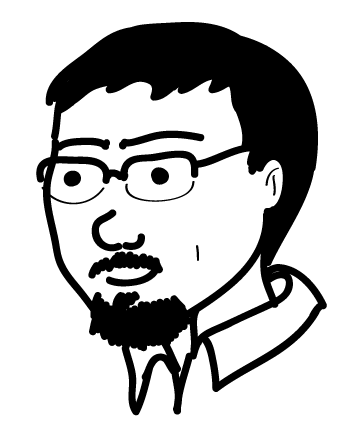 I’ve been drawing Ben as a cartoon for a few years now, but it’s so much better with the tablet. He looks all professional and digital now. If he’s really cool, he’ll use it as one of his avatars somewhere online. That would totally make my day. This entry was posted in crafty mama, DS106 and tagged cartoonben, ds106 by Nikkapotamus. Bookmark the permalink. This is nothing short of brilliant, the likeness is so precise. Wow, Ben is so lucky to have someone effigizing him all the time—so fun! And I think you need to submit this as assignment, it is time! She’s good at keeping my ego in check after making all the cartoon portraits of me. I totally dig that she finally has one of me with facial hair.